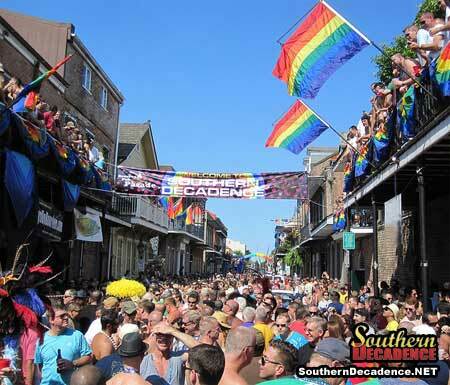 Southern Decadence started forty-eight years ago as a simple going-away party. As a top gay Labor Day Weekend destination, it has evolved into one of our world's major annual events. It is one of the largest annual celebrations and festivals in New Orleans, and has become known as the "Gay Mardi Gras." People begin to arrive on the Wednesday before Labor Day, and generally don't even think about stopping or going home until the following Tuesday. Attendance in 2018 broke all records, with over 250,000 gay, lesbian, bisexual and transgender participants, and an economic impact estimated to be in excess of $275 million. New Orleans' wildest neighborhood gets even crazier as the French Quarter is packed for the entire event; however, the big day is Sunday. That's when the Grand Marshals lead the annual walking parade through the streets beginning at 2 p.m.
at The Bourbon Pub / Parade. The corner of Bourbon and St. Ann Streets is generally considered to be the epicenter of Gay New Orleans, and even more so during the Southern Decadence festival weekend. At that intersection is the largest gay nightclub, The Bourbon Pub video bar and The Parade dance club, which is home to the hottest dancers in town. 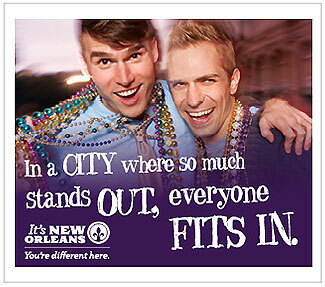 And most of the city's main gay attractions are within a few blocks. Most street party activities take place in the immediate area of the French Quarter, and the dance parties are in the clubs. Since the gay bars never close, there is something happening around the clock. Some of the nation's best DJs work the crowds to a frenzy. to provide the video entertainment at The Bourbon Pub. No wonder the weekend is often referred to as Southern DecaDANCE! returning for her 14th consecutive year). The Bourbon Street Extravaganza will return in 2019 for its 15th anniversary. Complete Bourbon Street Extravaganza information is HERE. Got a question? Please check our list of Frequently Asked Questions.